appcmd list site /config /xml > "h:\temp\iis export\sites.xml"
appcmd list apppool /config /xml > "h:\temp\iis export\apppools.xml"
appcmd add site /in < "h:\temp\iis export\sites.xml"
This ran without errors, and the new IIS 10 listed all of the old sites. The configuration files were also altered to reflect a change in file paths and local IPs which were updated without problems. 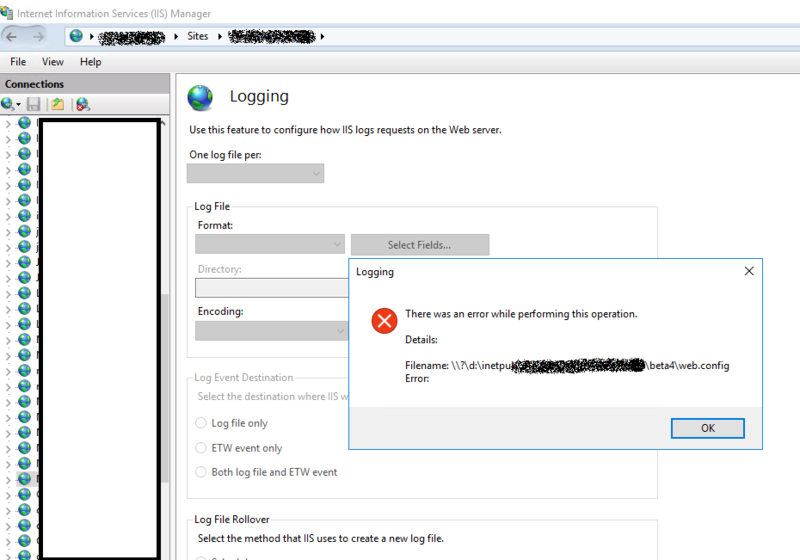 The problem is that whenever I select a site within IIS, and go to any of the properties (in the below example logging), it throws an error stating that it cannot find the file path for the web.config. The file path is correct, but there appears to be a \\?\ prepended to the file path. I don't know if this is the reason why this error is occurring, nor how to correct this. In this instance it turned out to be that he URL rewriting module for IIS was not installed. Annoyingly the error message produced for if a configuration file contains an element that is not installed is simply that it cannot read the config file, rather than which tag was the cause.